As you can probably guess from the title, I fell hard for a small Scottish island. Very hard, actually. We first traveled to Islay in August 2014, one station on a two-week road trip through Scotland. We spent just two nights there, which meant we only had one full day to tour the island, and that one day turned out to be pretty wet. Like pouring buckets wet. We didn’t mind too much, booked a rather spontaneous whisky tasting at Laphroaig distillery, and enjoyed ourselves. In October 2015 we spent three nights on Islay, again as part of a road trip, and this time around, the weather gods seemed to love us – beautiful, almost summery days, and some of the loveliest rainbows we have ever seen (yes, we had some rain, and no, we didn’t mind, we live in northern Germany, you see…). It’s a perfect destination for shorter trips, like a long holiday weekend, from our home base in Germany – just a short flight and a couple hours by car and ferry. Take the first flight to Edinburgh or Glasgow, make the early afternoon ferry, and enjoy tea time at a lovely Bed & Breakfast on Islay. Complimentary whisky at your Bed & Breakfast – maybe not at each and every Bed & Breakfast, but definitely at The Bowmore House, which is not only located in walking distance of Bowmore distillery but also licensed to supply whisky to their guest. Which they happily do, even in form of a breakfast dram, if you are inclined to be adventurous (and don’t need to drive). And no, I did not start every day like that. Nor should you. Drivers wave and greet wherever you go. When you first leave the ferry, it takes a moment to get used to everybody and his dog waving at you, but you soon appreciate the friendly gesture (just like the Jeep wave or the biker wave) and wave back automatically. 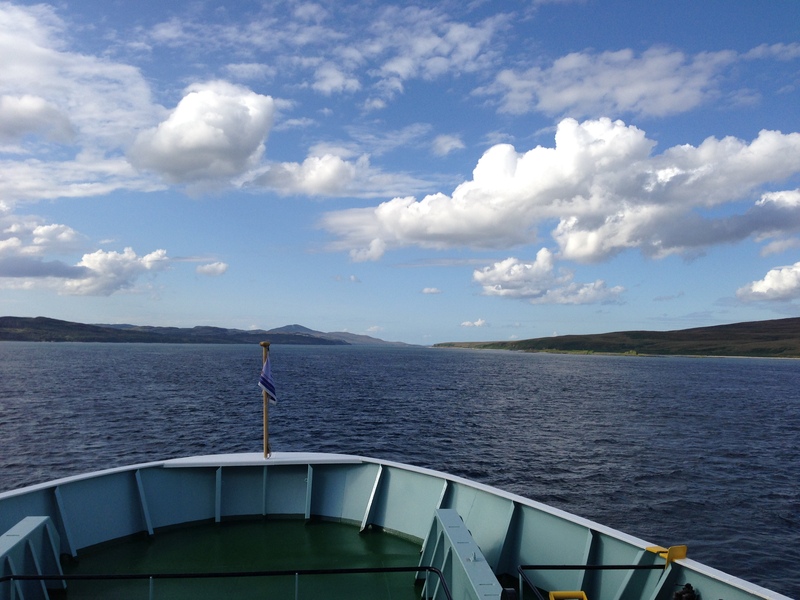 Feels weird when you leave the ferry in Tarbert and immediately start missing the Islay wave. Most of the roads on Islay are single track, and you need to use passing places, so it can be quite distracting to watch for the next passing place, stay on the right, err, correct (left!) side of the road, and return the wave. Thank goodness I did not have to drive but could enjoy the scenery! Trust me, the small white blobs really are sheep! Sheep! Sheep are absolutely everywhere, even all over Islay Airport. Which might or might not be due to the fact that the runway is basically in the middle of pasture land. Especially in combination with green meadows and blue sky, sheep are PRETTY! Whisky! Definitely not on top of a teetotaler’s list, but the sheer amount of distilleries on Islay make this little island extra special. On our two trips to Islay so far, we have toured Laphroaig, Caol Ila, and my personal favorite Bruichladdich, and we have at least visited the shops (sometimes including a little tasting) of Bunnahabhain, Ardbeg, Lagavulin, Bowmore and Kilchoman. Oh, this is great! I was just looking for something like this and since I live in Germany too, I’m going to suggest this to my boyfriend! This looks like a lovely place! Scotland is high on my bucket list, but this just pushed it higher! My favorite is #4 – who doesn’t love whisky at your bed & breakfast? Great post! If you can handle driving on the “wrong” side, rent a car and have a little Scottish road trip from Edinburgh past Stirling Castle and Loch Lomond to Tarbert/ Kennacraig Ferry Terminal. Takes about 4 hours, then another 2 hours or so on the ferry to Port Ellen. Highly recommended! I will have to add this on my list of destinations to visit! Lovely! Me too, makes you feel so welcome! Scotland is absolutely amazing. I visited it last year for the first time ever and instantly fell in love with the landscapes! Know what you mean, Kinga. Our first visit was in 2013, have returned twice so far (2014 and 2015), will definitely return again! Okay, I HAVE to visit Scotland! I am definitely a Whiskey girl at heart and this sounds heavenly!